SPK-05... Sold by the Each. 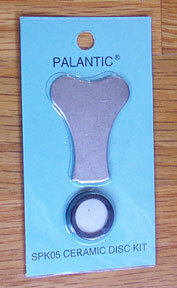 16mm Ceramic Disc with Key Tool. This Palantic Sky Mist disc will extend mist capabilities an average 3000 hours extra. Disc is specific to this series. Each unit already comes with this disc but extra may be purchased. Black rubber protection ring on disc must be removed before installation. Skymist disc comes with specail tool for removal of old disc. During Installation hands and inside of the light unit must be kept bone dry. Moisture inside won't damage the unit but will cause it not to mist. I find a hair dryer helpful to eliminate any moisture. After install unit may not mist to capacity but it will ususally improve after a few days of constant use. Install with White side up. Disc is approximately 5/8" in diameter.